School’s out for summer! At least it is in Greece, where the kids get a cool 12 weeks off for their summer holidays. On Friday evening we attended Lithakia Primary School’s end of year concert, which was held in the school yard as the sun set behind Megalo Vouni (the “big mountain” behind Lithakia). 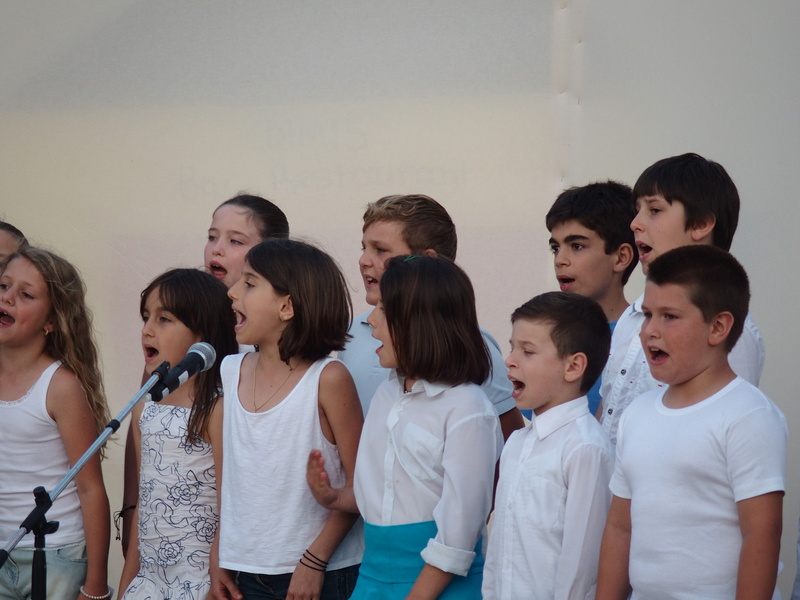 Our kids gamely sang songs and recited poems, in Greek, and as the evening ended, ran amok with their fellow classmates. Ralph and I sat in the audience with my parents and enjoyed the evening, mild and with barely a breeze. 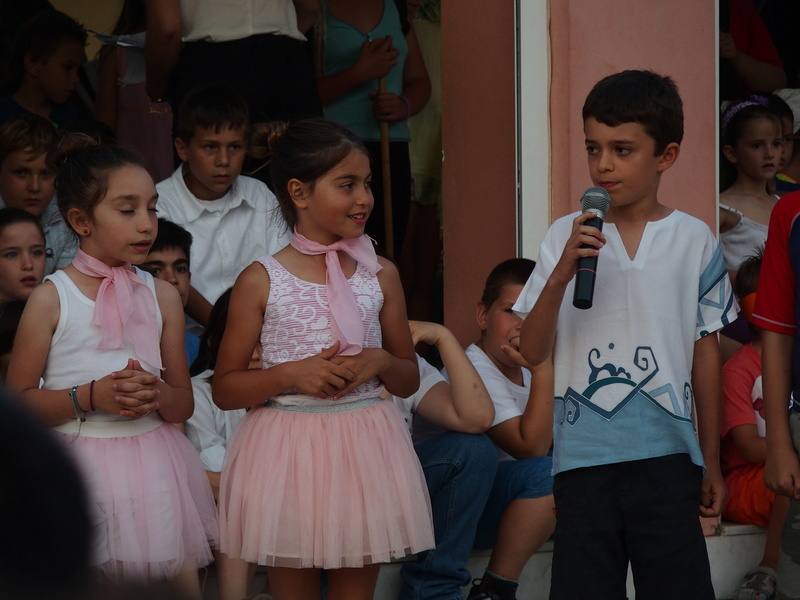 We were also basking in the success of what, a few months ago, had seemed a daunting prospect – sending two Aussie kids with minimal Greek language skills to school in a Greek village. On the day the boys had started school, they were nervous and apprehensive about fitting in. They were welcomed by the whole school, however, with an introduction from the headmaster and a round of applause from the assembly of kids and teachers, and we left them hoping for the best. I spent that first day wondering how they were getting along, and anxious to find out their impressions. Thankfully they both returned with smiles on their faces and told us that their teachers were nice and that they’d already made some friends. I was relieved that they’d fit in so quickly until I learnt why: they had both found bilingual kids in their classes, and so had spent all the breaks talking and playing in English. 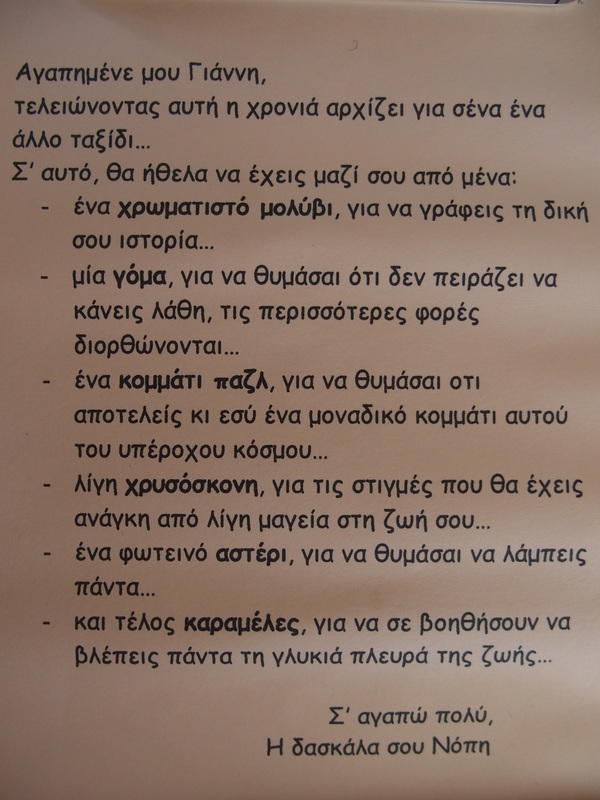 I quickly realised that my dreams of them achieving fluency in Greek weren’t going to eventuate. Despite all that their Greek has improved, and towards the end Alexander was playing with kids who only spoke Greek. If school had lasted a bit longer I think they would have improved dramatically. As it is they spent a happy eight weeks in a village school happily playing with the local kids. – and finally, sweets, to help you to always see the sweet side of life. God, wish I’d had a teacher like that! Also watch out for that young lady, it looks like she’s smitten with Eoin. What a wonderful experience your children have had. I’m sure a memory they will look back on with pride. We were proud of them for coping so well.